It is that magical time of the year, holiday makeup launches! I especially love kits with deluxe size lippies, because let's be honest I rarely finish a lip product. 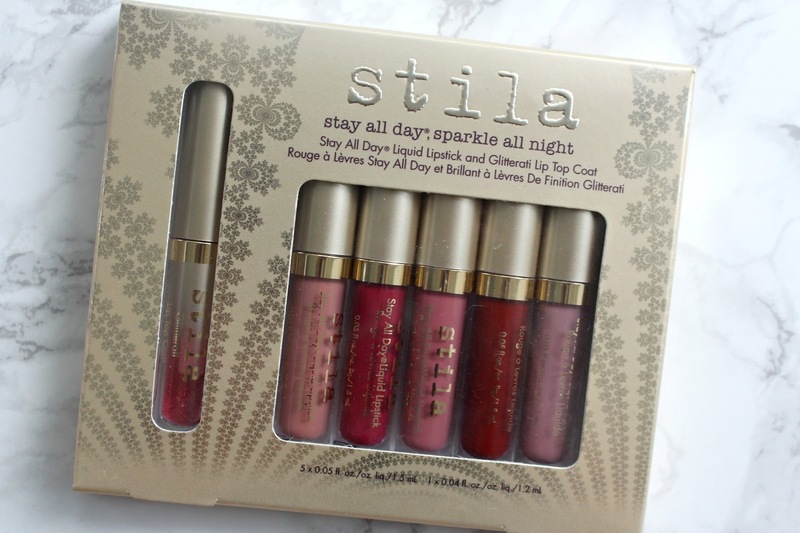 The Stila Stay All Day Sparkle All Night Set is available on both Sephora, Ulta and Beauty Bay. It retails for $51 CAD and $39 USD. It includes 5 of Stila's Stay All Day Liquid Lipsticks and the Gliteratti Lip Top Coat. 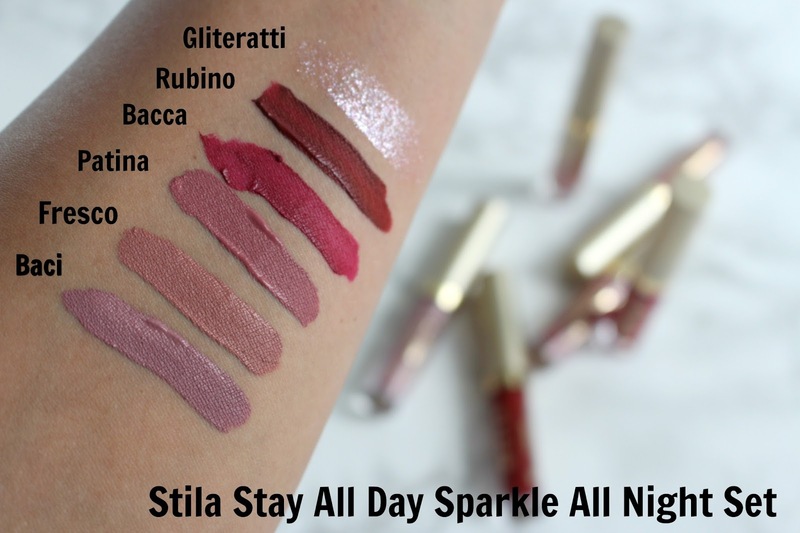 Stila Stay All Day Sparkle All Night: 8.8 mL of product at $51 CAD = $5.70 per mL. Stila Stay All Day Liquid Lipstick: 3 mL of product at $31 = $10/mL. Good deal all around in my opinion! Overall I was super happy with the consistency with all the shades. Nothing was patchy, they all went on smoothly and dried down matte. 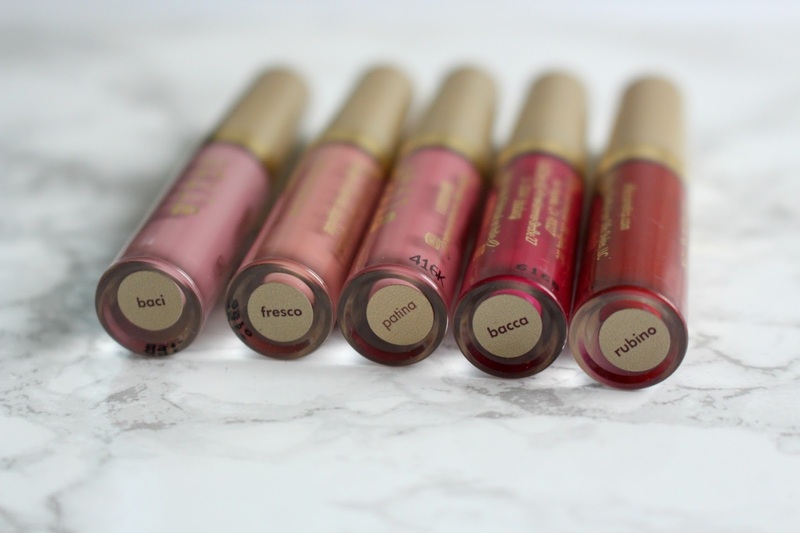 I don't find the formula incredibly drying, no more than any other liquid lipstick out there! I am happy to put up with a little dryness for a nice colour and matte finish. Fresco, mid tone dusty rose. Stila Stay All Day Liquid Lipstick Fresco, with topcoat on the right. Stila Stay All Day Liquid Lipstick Baci, with topcoat on the right. Stila Stay All Day Liquid Lipstick Patina, with topcoat on the right. Stila Stay All Day Liquid Lipstick Rubino, with topcoat on the right. Stila Stay All Day Liquid Lipstick Bacca, with topcoat on the right. The Stila Gliteratti Top Coat is interesting. It almost feels like it is glitter suspended in water, I thought it would be a thicker gloss formula. I guess it makes sense if it is too thick the formula may cause the liquid lipstick to break down. I had no issues with that. In the tube it looks like it is a soft red glitter but on the lips it was much more of a clear, near silver glitter. Overall I think this is cute, but I am glad it comes in a mini size because I don't think I will get a ton of use out of it. It's nice to have for when I want to try something different, perfect for the holidays! It has a bit of a perfumey taste so if you are sensitive to that, heads up. 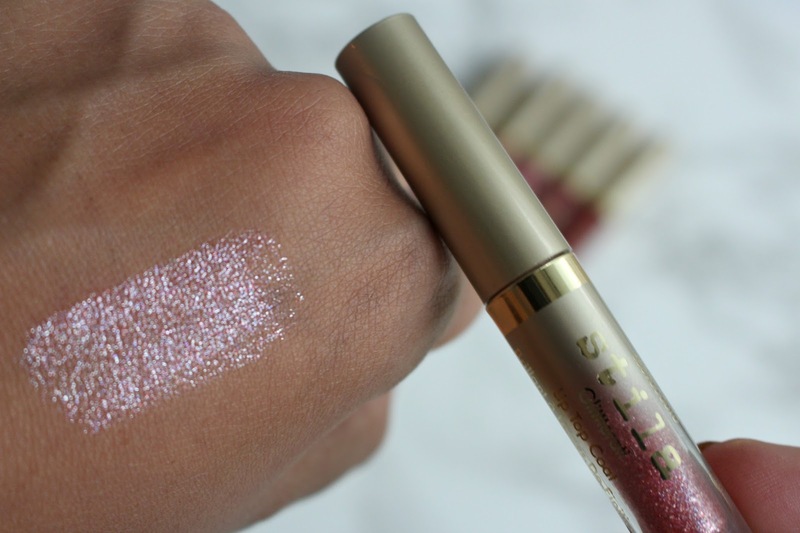 With or without the Stila Glitterati Top Coat I think this is a great set if you have any interest in the Stila Stay All Day Liquid Lipsticks. Or, if you have friends that are lipstick lovers you can buy the set and split it up amongst them.